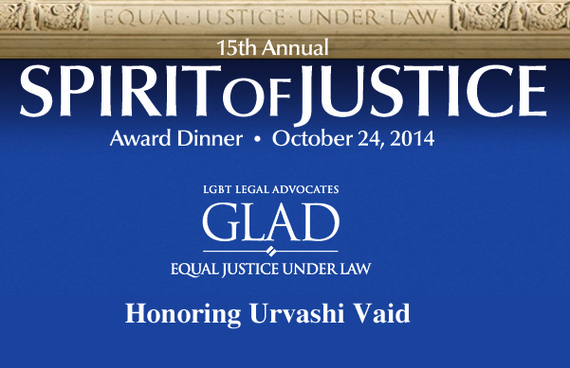 This week I talked with Urvashi Vaid, who has been a leader in the LGBT and social-justice movements for nearly three decades and is being honored by Gay & Lesbian Advocates & Defenders (GLAD) with the Spirit of Justice Award on Oct. 24 at Boston Marriott Copley Place. She has made change for the LGBT community through her leadership of numerous LGBT organizations. Most recently she founded LPAC, the first lesbian political-action committee, and her writings have pushed the LGBT movement to be more expansive in its thinking and more inclusive in its work. I would really like us to do two things. One is to take care of the parts of our community that are less powerful. That means low-income LGBT people, transgender people and our community's women, whose rights are getting the crap kicked out of them, parts of our community across the board -- kids, old gay people -- parts of our community who are less powerful than middle- or upper-class professionals like me -- for our organizations, donors, our foundations, our media outlets to focus the spotlight and focus their work on the full parts of our community. The second thing I would love to see happen is for the LGBT community to use its political power and access to create a more just society for all. We have done a great job advancing and pulling together, and that kind of unity that got us to this point, I would like to see it sustained over the next few years so we can use that power that we've been organizing to push back some of the right-wing policies in this country, and to push for a more inclusive and just society, which really is the queer vision. LGBT people vote more progressive in general. LGBT people care about the environment. We care about leaving a better world for our children and for future generations. Those sets of values that we have of compassion, community building, of caring, of stepping up and shouldering responsibility, which we have shown again and again, I hope are the qualities that will guide our movement in the coming years. Urvashi Vaid is a graduate of Vassar College and Northeastern University School of Law. She is currently Director of the Engaging Tradition Project at the Center for Gender and Sexuality Law at Columbia Law School. In 2012 Vaid authored Irresistible Revolution: Confronting Race, Class and the Assumptions of LGBT Politics (Magnus Books). On Oct. 24 she will receive the prestigious GLAD's Spirit of Justice Award at their 15th annual fundraising dinner event in Boston.